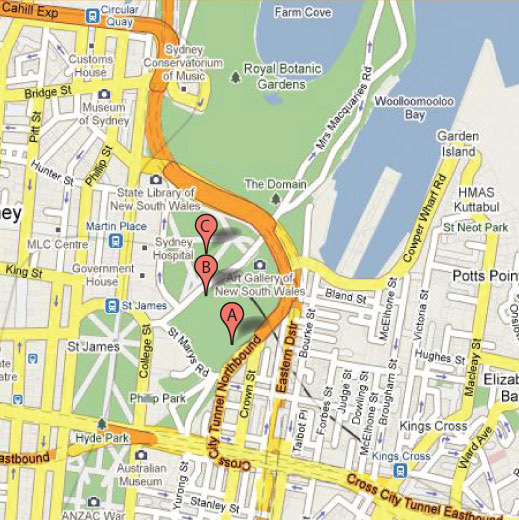 Sydney Botanical Gardens is located on the eastern edge of the CBD, with playing fields overlooking Wooloomooloo Wharf. For most office workers, this is an easy 10 minute walk. Soccer, Touch Football & OzTag games are played on the Crescent Precinct, right hand side of the Art Gallery above the domain car park (A). Netball and Volley Ball are also played at the Crescent Precinct, but at the top of the hill to the right hand side of the Art Gallery (B). 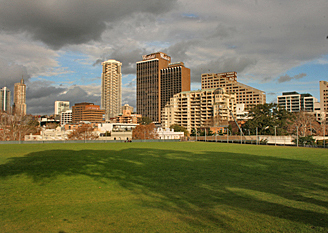 Some games are played on the Phillip Precinct which is at the Centre of the domain (C). Art Gallery Road Royal Botanical Gardens.